Lana Condor arrived to the premiere-week screening of Deadly Class serving total Valentine's Day vibes, and we are totally heart-eyes over the 21-year-old's look. The To All The Boys I've Loved Before star stunned in this an all-pink style—from the Peter pan collar to shirt and the simple skirt, it's a look that's classic and sweet from top to bottom. And we know just how you can recreate it. Her shirt is originally from REDValentino for about $495 while her skirt, from the same brand, retails for $395. So basically, her outfit is close to $1,000. You can get this look for *way* less, though. 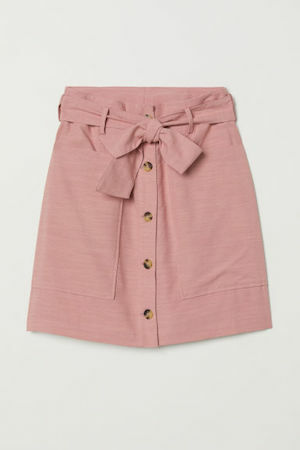 Style this heart-print top from Forever21 with an A-line pink skirt (we love this one from H&M). At just $10 for the shirt (it's on sale!) and $25 for the skirt, you can look like Lana for $35. Pull it all together with your favorite red pumps or flats and you'll be ready to slay this V-Day. What emojis would you give Lana's outfit? Tell us below.